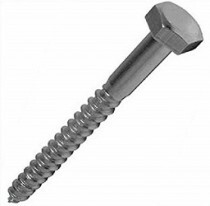 A traditional heavy duty woodscrew used mainly for timber to timber applications, attaching ironmongery to timber or for use with a nylon plug into masonry. Pilot holes may well be required in certain hard woods such as oak. Produced to the DIN 571 recognised standard.